My City My Six is a participatory public art project that will reveal Toronto and its residents in celebration of Canada 150, six words at a time. 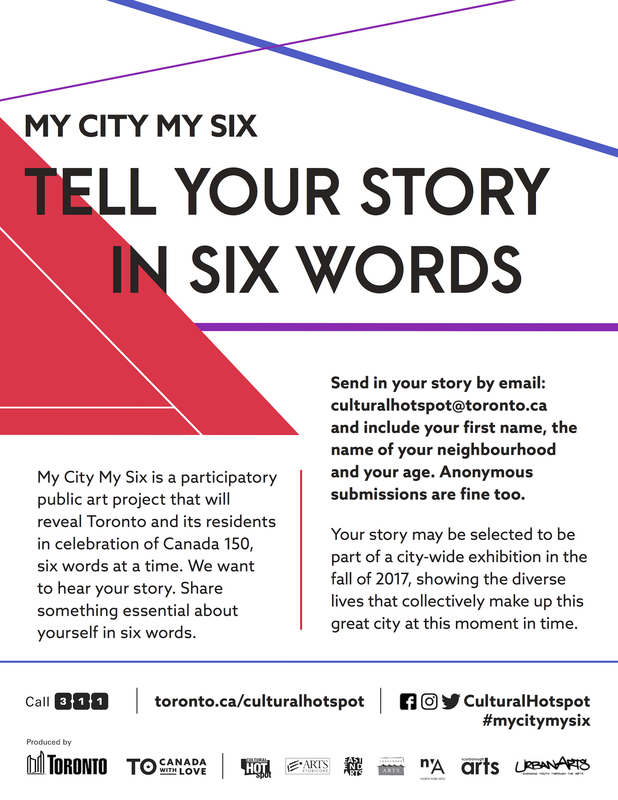 From January through May 2017, the My City My Six project will ask Torontonians of all ages and backgrounds to share something essential about themselves in six words. Ernest Hemingway was once challenged to write a six word story. He responded with, “For Sale: baby shoes, never worn”, and the six word story was born. Based on the six word story concept popularized by Smith Magazine, this project invites Torontonians to write and contribute six words that best tells their story. My City My Six will culminate in a city-wide exhibition in the public realm in the fall of 2017, showing the diverse lives that collectively make up this great city at this moment in time. This project is led by Toronto Arts and Culture in collaboration with the city’s six Local Arts Service Organizations. Stories will be collected through emails, workshops, and events. A jury, including Toronto’s Poet Laureate Anne Michaels, will select stories to appear in the exhibition, which will include transit shelters, transit interiors, billboards, and other public spaces. Local galleries, businesses and public spaces will also be animated as part of the exhibition in September and October 2017. If you have questions about the My City My Six project, please contact Andrea Raymond-Wong, Community Cultural Coordinator at Andrea.Raymond-Wong@toronto.ca or 416-338-2469. – Alf, 17, North Mpls. – Gabrielle, 99 SW Seniors Ctr.